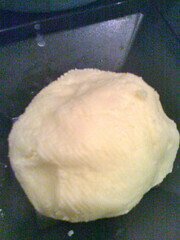 Last night I made butter! CSP saw some tv show on Food Network where this chef lady made butter and he wanted to try it. So we bought the ingredients and while he was grilling last night I made some butter. It was way easier than I thought it would be. You take 2 & 1/2 cups of cream. Now, obtaining the cream can be a problem. We went to many stores but no one sold just cream. They had half and half and heavy whipping cream but nothing that said just plain old cream. The chef on the show didn’t say anything other than cream so I was in a pickle. I asked my Aunt Marsha, a serious foodie, if I could substitute the heavy whipping cream and she thought it should be ok. So I poured the cream into the mixing bowl and added a cup of sour cream. I would definitely recommend making this in a stand mixer versus using a hand mixer. You mix for quite a while. The chef lady said to mix on low, but the close up showed she was also using a KitchenAid mixer and it was on 4 so I put mine on 4. A few minutes later it started to look like watery cottage cheese. Now, I didn’t hover but I kept an eye on it. While it was mixing I was cleaning out and refilling my hummingbird feeders. CSP came in and took a look in the bowl then we went outside to the backyard so I could rehang the feeders. I was in and out in less than 2 minutes. I came back in and heard a loud whomping noise! In less than 2 minutes that watery cottage cheese had turned into butter! 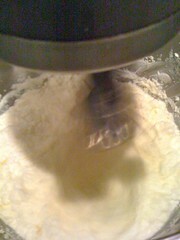 It was all glommed on to the whippy beater thing and was making the mixer rock back and forth. Buttermilk was splashing all over my kitchen. Cabinets, countertops, floor, all over! But who cares cause I had butter! I put the butter and beater into a bowl that I covered with cheese cloth then poured the buttermilk and remaining chunks of butter into the bowl. I scraped all the butter off the beater and gathered it all up in the cheese cloth. 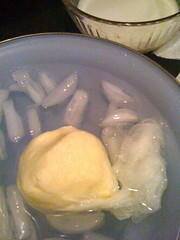 I squeezed out the excess moisture and dunked the butter ball into an ice bath. You can see the buttermilk in the picture in the glass bowl. If I were a better baker I could have used that buttermilk (and all the extra buttermilk that was all over the kitchen) and made some biscuits. I pulled the cheese cloth off the butter and stored it in a Tupperware container. You could put it in little molds or stamp designs in it. We tasted the butter and it was so fresh and creamy! I can’t wait to make flavored butters- honey, cinnamon, garlic, herb, so many possibilities! I used to make our butter too! So much fun. It is like magic. Enjoy!! I didn’t salt mine either. I liked the sweetness of it. Glad it worked out for you too! You should totally try it! It’s way easier than I thought it would be! I really want to try it! I wonder how long the buttermilk would last if I froze it? Hmm, I don’t know a thing about freezing buttermilk. But I figure it should last a little bit because you’re using pasteurized sour cream and whipping cream so it’s not like it’s going to spoil in a day. You made butter!! Dang cool, woman!